Former candidate and party activist William “Bill” Wenzel Jr. Bill was the 2014 Libertarian candidate for Michigan Senate District 26, receiving over 2,900 votes. He also actively involved in leading outreach activities such as the party’s participation in the West Michigan Gun and Knife show. “Bill was a great spokesperson for liberty. He was outgoing and engaging. 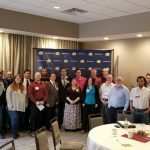 We will miss him” said Libertarian Party of West Michigan Chair, Jamie Lewis.